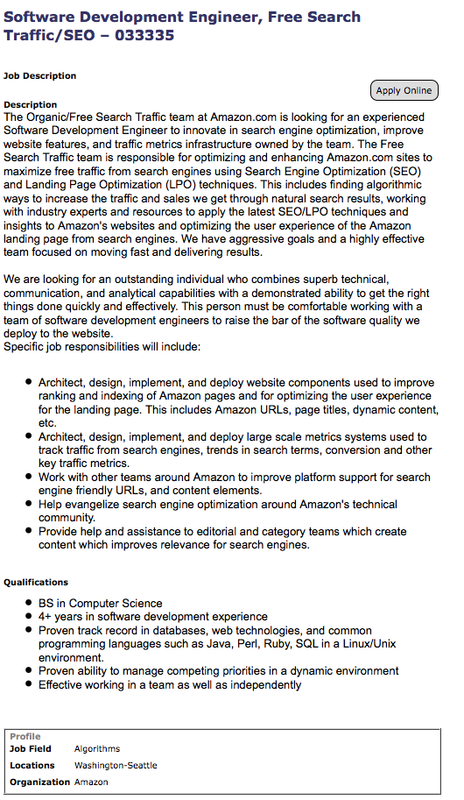 I thought this job opening for a Free Search Traffic / SEO Software Engineer from Amazon.com was interesting. Amazon.com understands the importance of getting free search engine traffic enough so that they have a position devoted specifically to making free search engine traffic happen in their business. 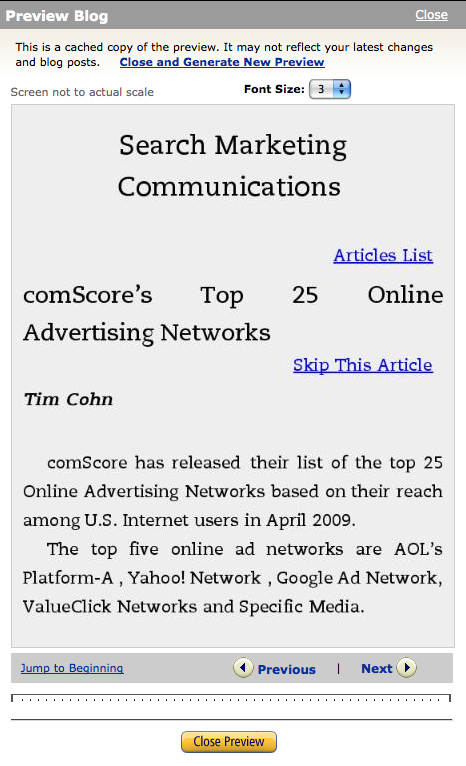 If your company hasn’t yet made search engine optimization a priortity – why? 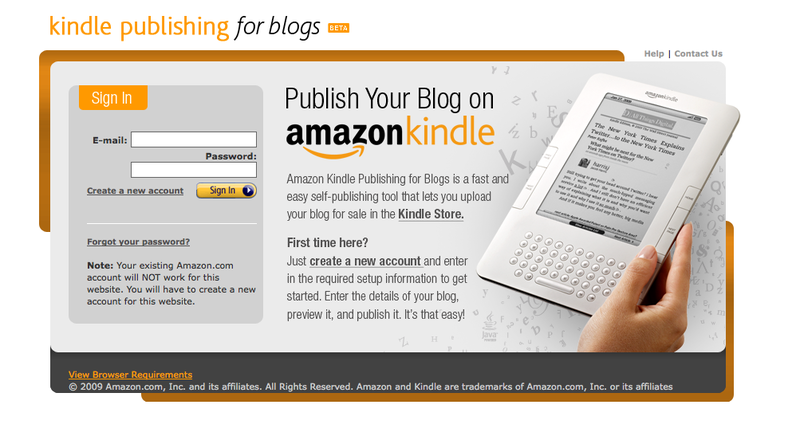 I signed up for Amazon Kindle for Blog Publishers yesterday. The entire process took just a few minutes. Several hundred periodicals and a similar number of blogs appear to be available on Kindle. 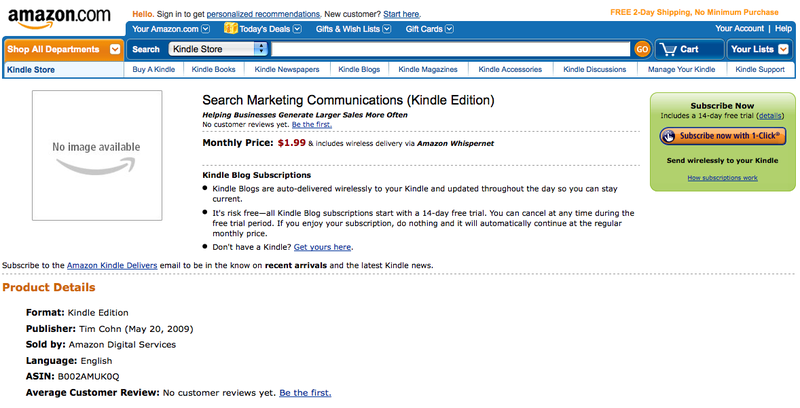 and the Search Marketing Communications blog as it appears on Amazon.com. If you are a blogger, publish your blog on Amazon Kindle. Amazon.com has published its 2008 best sellers list (based on units ordered November 15th – December 19th) in addition to noting its 14th holiday retail sales season was its best ever. 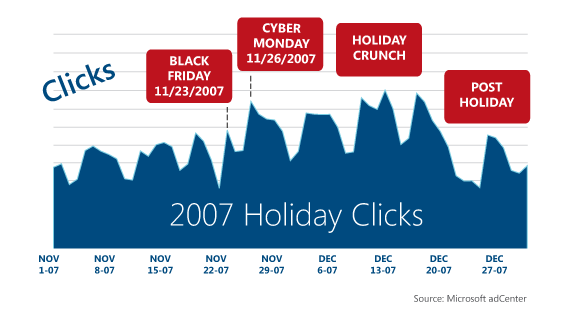 December 15, 2008 was Amazon’s peak sales day. On December 15th (Two Mondays before Christmas and not Cyber Monday – Max Monday? ), Amazon processed orders for 6.3 million items, which was a record-breaking average of 72.9 items sold per second. — In toys, top sellers included the Eyeclops night vision stealth goggles, Blokus classic board game and Wild Planet’s Hyper Dash. — Top sellers in consumer electronics included Samsung’s 52-inch 1080p 120Hz LCD HDTV with RED Touch of Color, the Apple iPod touch 8 GB (2nd Generation) and the Acer Aspire One 8.9-inch netbook (1.6 GHz Intel Atom N270 processor, 1 GB RAM, 160 GB hard drive, XP Home, 6 cell battery), sapphire blue. — Nintendo Wii dominated the top sellers in video games and hardware including the Wii console, the Wii remote controller and the Wii nunchuk controller. — Top sellers ordered from Amazon Mobile web and TextBuyIt include Monopoly Here and Now World, the Nintendo Wii and “Wall-E” (three-disc special edition + digital copy and BD Live) for Blu-ray. — In software, the top sellers included Microsoft Office Home and Student 2007, Norton Antivirus 2009 and Microsoft Office 2008 for Mac Home & Student Edition. For their complete list of 2008 best sellers visit Amazon.com.